Are parlays a sucker’s bet? 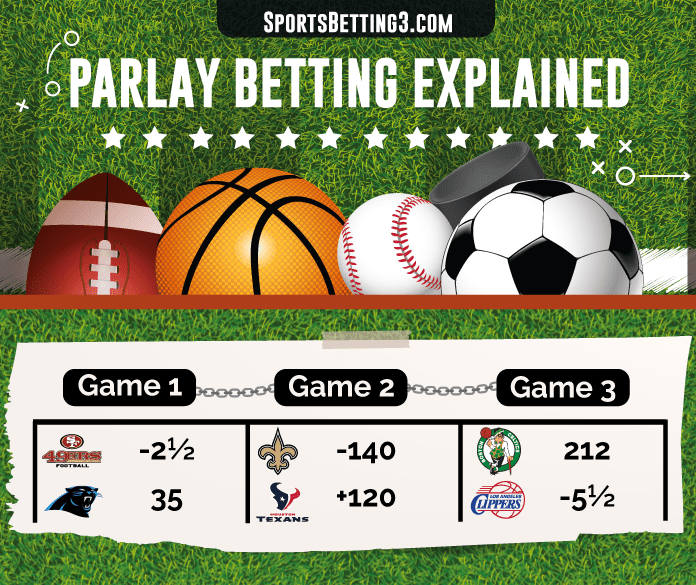 Parlay betting explained. Learn when to use parlays. Straight bets don’t reward winning bettors like parlays! Review payouts and odds. Know your parlay’s house edge. Consider making a Round Robin parlay bet. Combine 2 or more spread, money line or total selections. Parlay wins if all selections win. Parlay loses if any selection loses. Choose from multiple sports. Football, basketball, baseball and hockey are most popular. Select 2-15 spreads, money lines, totals or combinations of all three. A tie reduces parlay size by 1 selection. See tie rules below. Popular Exotic Bet. Football, basketball, baseball and hockey parlays are most popular. Fixed payouts apply to standard odds (-110) selections. See tables below. Payouts vary with non-standard odds. Rounding may alter final amount. Maximum payout rules apply. Most sportsbooks limit single payouts to $100,000-$150,000. Futures and props. Other exotic bets. Both sides of same bet. Example: Combine the over and under for same game. Spreads and money lines for same team from same game. Includes different game segments. Correlated 1st half, 2nd and full game parlays. Spreads and Money Lines for full game with 1st half totals might be permitted. Celtics vs. Clippers Over -110. Texans +120 Money Line contains non-standard odds. Payout is calculated using true odds. See formula below. Bets wins $701.82 if successful. Final number may round differently. Parlay contains standard odds. Payout calculated using fixed odds. See parlay card below. Bets wins $260 if successful. Each selection wins, loses or ties according to game outcome. Parlay wins if all selections win. Parlay loses if any selections lose. Each tie reduces parlay size by 1 selection. Any selection graded No Action reduces parlay by 1 selection. Subtract all tie selections from parlay size to determine updated payout amount. Example: 4 selection parlay with 2 ties becomes a 2 selection parlay. 8 selection parlay with 3 ties becomes a 5 selection parlay. Instances of multiple ties are not common. Payout is determined from remaining number of selections. Parlays reduced to 1 selection become straight bets. Less common: Parlays reduced to 0 selections tie. Suppose Celtics vs. Clippers score is exactly 212. The over 212 total would tie. The parlay would reduce to 2 selections. 49ers -2½ and Texans +120 remain. Bet wins $320 if these 2 selections are correct. Suppose Broncos -3 wins by exactly 3. This would tie the spread. The parlay reduces to 1 selection. Rams +6½ remains. Parlay becomes a straight bet. Bet wins $90.91 if Rams cover the spread. Parlay payouts are much higher than separate straight bets. Bet small amounts to win larger payouts. Ideal for those with limited bankrolls. Or those with extra cash for fun bets. Parlays can be more profitable than straight bets. Bettors winning 55% or more can expect higher profits. See example below. Parlays carry more risk than separate straight bets. One losing selection ruins entire bet. Separate straight bets allow room for error. This produces smaller percentage losses. 5 or more selections have a negative value. Large parlay wins are rare. The house profits from these bets more than players. Poor choice for bettors winning 50% or less. These bettors face higher negative expected value compare to separate losing straight bets. See example below. Sportsbooks occasionally offer modified parlay cards. These cards offer higher than normal payouts. See sportsbook promotions page. Bet parlays with true odds payouts. Fixed odds payouts are less than true odds. Keep parlays to 4 selections or less. It is rare to win large parlays. These bets do not justify the risk. Analyze football and basketball ATS trends. Combine multiple winning teams into a parlay. Combine Money Line favorites into a Parlay when juice is >-250. This parlay would risk less than separate straight bets. Combine opposite side of straight bets into a parlay. Make money back with winning parlay if all straight bets lose. Round Robin Parlays. Bet multiple smaller parlays instead of one large one. Break selections into smaller combinations. Bet each combination separately. 3 selection parlay becomes 3 x 2 selection parlays. Only 1 of these parlays must win to profit. See example below. Bet heavy money line favorites in a 2 or 3 selection parlay. Separate straight bets would require more bankroll. College Basketball Home Underdogs. Combine 2 home underdog money line selections. Home court advantage often benefits home underdogs. College Basketball 1st Half Correlated Parlay. Look for large spread to small total ratios. Example: 25% correlation means 15 point spread to 60 point total (15/60 = 0.25). Bet 2 first half parlays: 1) Favorite and Over, 2) Underdog and Under. These are rare occurrences. Many sportsbooks prohibit correlated parlay betting. Parlay card betting preceded modern parlays. These cards surfaced in the USA during the late 1800s as sporting leagues organized. They were commonly found at early ball games and nearby bars. The Progressive Movement of the early 1900s initially stunted the spread of parlay card betting. But the arrival of the roaring 1920s, professional football, and better organized gambling syndicates brought them back. Nevada was the first state to fully legalize casino gambling in 1931. Despite this change, sports betting remained in the shadows. Most bets were illegal. Eventually it became better regulated. But not before many legal operators left the market due to a 1951 tax. The tax decreased in October 1974. Legal sports betting operations became profitable again. Parlay bets modernized as sportsbooks competed with one another for business. Bettors still reference Parlay Cards for standard “Vegas Odds” before making their bets. 1. Calculate Multiplier for Each Selection. 2. Multiply each multiplier together. 3. Multiply product times bet amount. Then subtract bet amount to get payout. Final payout amount may vary with rounding. Ways = Size of each individual parlay. Total Parlays = Number of unique parlays in entire Round Robin. 4 Selections, 2 ways makes 6 unique parlays. A,B,C and D represent 4 different selections. Each selection must combine with the others, no duplicates. Bet Cost: Total Parlays x Desired Amount. Conclusion: Increased parlay payouts benefit the winning bettor. Hint: Expected profit & loss is the difference between maximum possible win and maximum possible loss given a bettor’s win percentage.